Our proven system will improve your braking performance, extend the life of your brake components, reduce brake maintenance and save you money. This inexpensive product installs in minutes and will last forever. 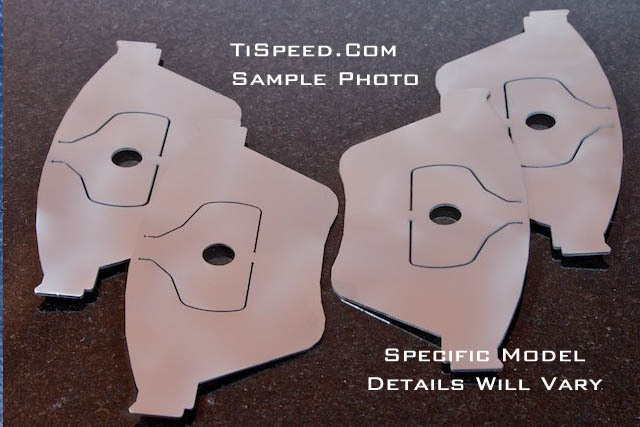 Our titanium brake heat shields are a quick, inexpensive and guaranteed method for managing your brake heat. They fit between your brake pad and brake caliper pistons to form a thermal barrier that protects your caliper and fluid from excess heat. More consistent braking on the track. Our brake shims help prevent the loss of braking power that occurs when brake fluid starts to overheat or even boil, a phenomenon known as "brake fade" that can cause catastrophic and sudden brake failure. 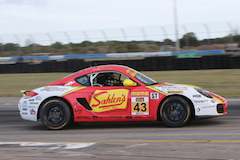 Hundreds of race drivers have verified for us that our heat shields allow them to stay out on the track longer and push their car to the limits harder than without them. Lower maintenance costs. Our heat shields have been proven to extend the life of your brake caliper components, including dust boots, caliper seals, piston surfaces and of course brake fluid. Why spend time and money repairing, rebuilding or replacing these when our simple product can reduce the maintenance intervals? Longer life for your brake pads. Top drivers know that as brake pads wear down they start to lose their "feel" because they transmit more heat to the brake fluids and because the caliper piston needs to travel further. Why throw away half-used pads when you can extend their life with our titanium heat shields to make up for the lost brake pad materials? For less than the cost of a single set of brake pads you can extend the life of all of your pads now and in the future. 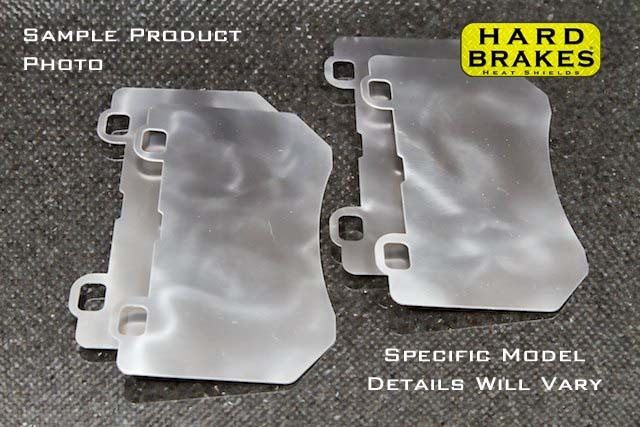 These titanium brake shields have a small fraction of the thermal conductivity of steel or aluminum materials used for brake pads and calipers, and provide a critical thermal barrier between your glowing hot rotors and your precious hydraulic brake fluids. 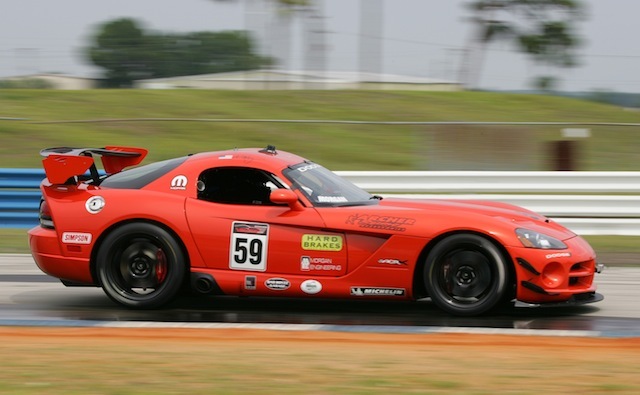 They give your track car the same proven brake heat mitigation materials used by major performance brake manufacturers like Brembo and top teams in Formula One and NASCAR, for a small fraction of the cost. We only use top-grade 6Al-4V titanium alloy for maximum thermal protection, structural integrity and corrosion resistance. Our brake backing plates are precision engineered and machined to exacting specifications. Each shield is designed to provide maximum coverage of the brake pad surface, providing protection against both conduction and radiant heat transfer. They can be installed in minutes using the same tools you use to change your brake pads. 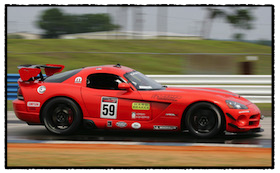 Our shields have been track tested and proven on a wide range of race cars and tracks. This is inexpensive insurance to help protect you from possible brake failure and a costly repair bill, or worse. 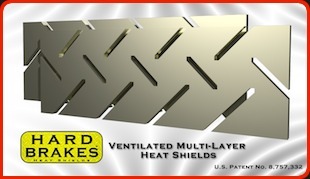 Hard Brakes provides two categories of brake heat shields. 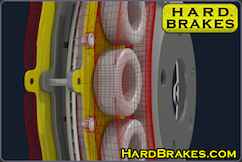 Our patented ventilated brake heat shields, and our solid brakes heat shields in a variety of thicknesses. 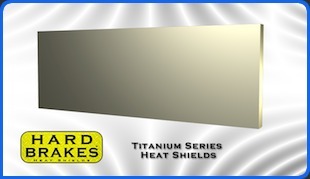 All of our heat shields are made only from top grade 6AL-4V titanium alloy. Ventilated Titanium Series heat shields are our revolutionary new patented technology that uses a multilayer design with overlapping cross ventilation channels to provide air flows to the critical boundary between the brake pad and caliper piston. The unique multi-layer air channel design allows excessive heat to be vented away from the boundary even under high pressure hard braking. It also allows cooling air to flow quickly into the boundary when the brakes are released, so that you get more effective cooling between braking zones. The result is that your ventilated heat shields act as a heat pump, using the heat generated by the friction of your brakes to force out hot air and draw in cooler air. This design is particularly effective when used in conjuction with brake cooling ducts that direct air into the caliper system, as they allow the cooling air to go straight into the area of the caliper piston that most needs it. Our Ventilated Titanium Series heat shields are made from top grade 6AL-4V titanium alloy. Titanium Series heat shields provide excellent thermal protection in a thin, solid format that will usually fit even with new pads or rotors. They are made from top grade 6AL-4V titanium alloy to provide excellent resistance to corrosion and the best resistance to heat transfer, several times better than stainless steel or other grades of titanium alloy, 6 times better than regular steel, and 30 times better than aluminum. 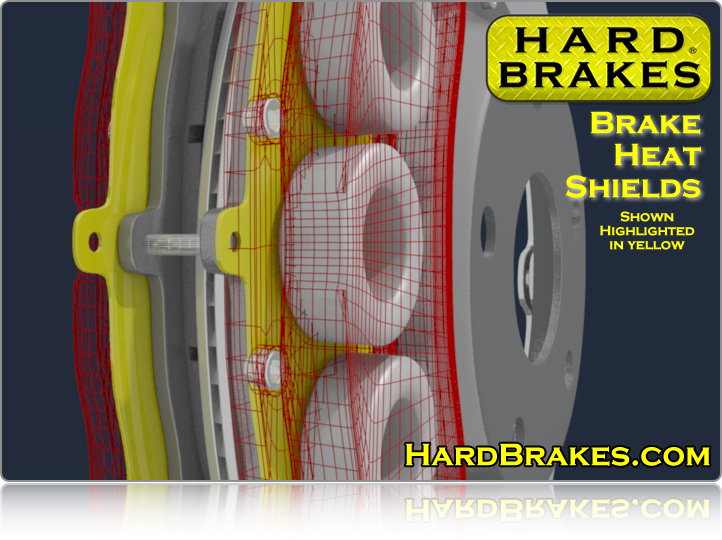 Hard Brakes offers Titanium Series heat shields in a range of thicknesses to meet your individual requirements.